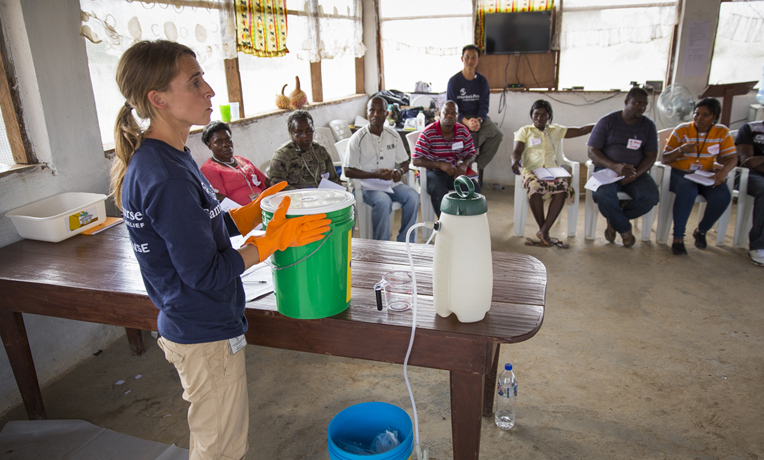 As Ebola infections continue to flare up across Liberia, Samaritan’s Purse is deploying small teams of courageous staff to train locals and provide them with the materials they need to stop the spread of the deadly disease in their villages. “We are seeing a decrease in cases in Monrovia, but the number of smaller outbreaks in very rural places is increasing,” said Kendell Kauffeldt, Liberia Response Manager. Leveraging our experience and relationships, credibility with the government, a robust church network, and aviation services, Samaritan’s Purse has the ability to act quickly and nimbly. When our Liberia team is alerted to a new hot spot, staff members on the ground are sent to assess the affected community. Once there, they attempt to quickly determine the number of infected individuals and the openness of the village to our help. If there is receptivity to our infection-prevention-and-control messaging, hygiene (IPC) kits are given to each household. These kits include chlorine-based disinfectant, rubber gloves, soap, and a bucket with a spigot. If there are current or recent infections, our staff members consult with village leaders and infected families. Should an Ebola Treatment Unit be located nearby, sick individuals are immediately directed there for the highest level of local care available. If such a facility isn’t close—which is likely, since there are only eight in the country—then community members are given the choice between a small mobile care center and home-based care training. Based on acceptance, Samaritan’s Purse implements their decision. This strategy responds to the latest shifts in national and international thought on the epidemic. Our Liberia team has distributed about 10,000 hygiene (IPC) kits to households since October, training a total of more than 26,000 individuals. In addition, two community care centers have been constructed and are ready to receive patients as needed. 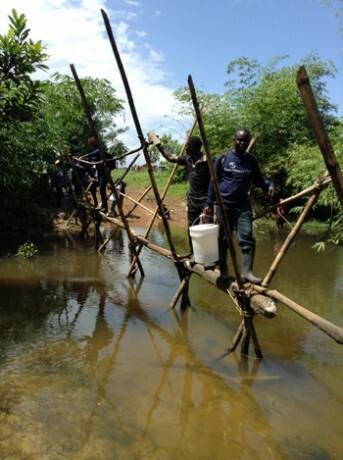 Getting supplies into infected communities can be a difficult task. The current outbreak of Ebola virus disease, the largest in recorded history, has claimed more than 5,500 lives between Liberia, Sierra Leone, and Guinea, the three primary countries affected. The World Health Organization has reported more than 15,000 total cases across the globe, including a few in the United States and other countries far from the epicenter. Many experts think, for various reasons, that both the numbers of deaths and numbers of cases have been seriously underreported. Samaritan’s Purse has been responding to the Ebola crisis in Liberia since March, building on more than a decade of relief programming experience in country. Earlier this year, Samaritan’s Purse medical personnel provided clinical care in Monrovia and Lofa County—until Dr. Kent Brantly contracted Ebola in late July (and subsequently recovered). Since September, international field staff and more than 200 national staff have concentrated on training Liberians to help Liberians. In line with this directive, the ministry airlifted 100 tons of relief supplies, including hygiene kits and home-based care kits, to the West African nation on October 1. We followed up by sending 90 more tons on November 5. Over the course of our response, more than 1 million Liberians out of 4 million total have been touched by our multi-platform information campaigns, including thousands of church leaders. Joseph Gbembo of Lofa County is just one of those who learned the facts about Ebola from our staff. He first heard the information while working on one of our water projects and now credits the knowledge with saving his life. His aunt traveled to Sierra Leone for a funeral this summer. She became ill and died after returning. Others in the family were in denial about the threat of Ebola and insisted on washing her body for burial. They soon became sick themselves. Joseph lost eight relatives, including his mother and some siblings, in just one week. Ebola killed most of Joe’s family. 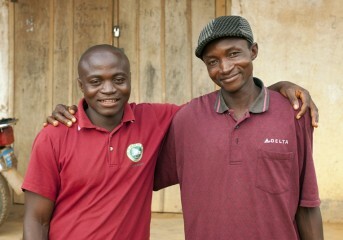 He is pictured here (at left) with his brother, Fayiah, the only family member he has remaining. Because he knew that Ebola germs could be killed with disinfectant, he acted accordingly. Joseph, grateful to still be counted among the living, now works for the Samaritan’s Purse Ebola Response Program and shares his experiences with others. Please pray for the protection of Samaritan’s Purse staff in Liberia as they respond to outbreaks of Ebola in remote counties. In addition to the threat of the disease itself, there are still many who remain in denial about Ebola. Others are deeply mistrustful of outsiders and refuse to accept our assistance, even becoming hostile. It’s critical to pray for the light and hope of the Gospel to reach many Liberians in the midst of this troubling situation.